The automotive market is set to grow by +3.0% in 2018 compared to +3.1% in 2017 and to slow down to +1.9% in 2019, with new vehicle registrations expected to exceed 100mn units in 2019, worldwide. Medium-term prospects remain favorable, with annual sales to reach 110 million units by 2022 mainly driven by the demand in China and to a lesser extent India. 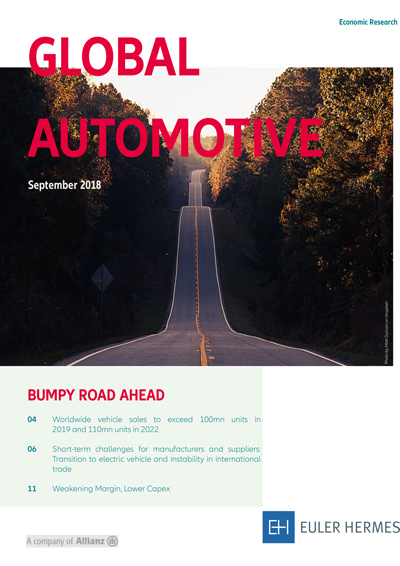 However, for manufacturers and suppliers, transition to electric vehicle and protectionism are leading to greatly increased uncertainty and rising costs, notably inputs costs, relocation of production and upheaval of supply-chains.